Walmart beat Wall Street’s earnings expectations on Thursday, nearly doubling the forecasted same-store sales growth rate. E-commerce grew 40% over the same period a year ago. Shares rose more than 10% in early trading Thursday following the release. Follow Walmart’s stock price in real-time here. 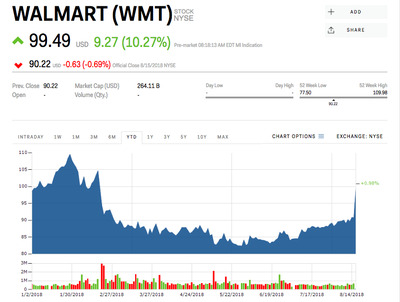 Shares of Walmart surged more than 10% in early trading Thursday after the US’ largest grocer reported an uptick in same-store sales and digital orders that helped it top Wall Street’s expectations. For the second quarter ended June 30, Walmart said it earned $US1.29 per share where analysts had expected $US1.22. Revenue also topped the expected $US126 billion to come in at 128 billion. The beat was fuelled by a 4.5% uptick in same-store sales, a closely watched metric for retailers, which nearly doubled the forecasted 2.4%. Walmart has also been aggressively pushing into the digital realm with expensive investments in companies like Jet.com, ModCloth, Bonobos and more. After taking a hit on its most recent fourth quarter earnings to pay for the acquisitions, they seem to be paying off. E-commerce sales were up 40% over the same period a year ago. Shares of Walmart are now up about 1% since the beginning of the year, but still well off their $US109 high set in January.